Year in and year out, Boom! Studios has some of the best quality control of all the mid-major comics publishers. Whether the title is associated with a big name like Irredeemable or creators I'd never heard of, I rarely find myself finishing a Boom! title and wishing for my time back. Whenever I see a Boom! book I haven't read yet at the library or on sale, I pick it up, because the odds are pretty good that I'll like it, and possibly find a new favorite. By this point in time, Boom! has quite a large library of comics, ranging from all-ages titles like the amazing work Ryan North and others are doing on Adventure Time to their work with Clive Barker's horror properties to space-faring epics like Hypernaturals. They have something for everyone and aren't afraid to experiment, such as letting Samuel L. Jackson romp his way through Cold Space (review here) or create an unlikely series such as Fanboys vs Zombies. With the addition of Archia, Boom! 's reach now extends into more deluxe-edition style comics, with amazing production values, to say nothing of the quality of the comics themselves. God Machine was so gorgeous I actually bought a hard copy, and the production value for things like their Fraggle Rock books were top-notch. For the show itself, Boom! is hosting three panels: A spotlight on their newest creator, George Perez (Saturday at 1pm), Boom! 's feature panel (Saturday at 3pm), and a spotlight on Mike Carey Sunday at 1pm. Baltimore is Mike Carey's only US show this year. Boom!-associated creators at the show include Perez, Carey, Paul Jenkins, Brian Stelfreeze, Mark Waid, and David Peterson, among others. Some will have signing times at the Boom! booth. You can find all my Boom! related reviews here and this is a link to my Archaia reviews. I'll also point you to my Extermination review for Newsrama, which is the one book any superhero fan must buy at the Boom! table, if they have it. Those who like Victorian-style Gothic stories should pay special attention to Hopeless Maine, which I reviewed for Newsarama here. Generally speaking, you really can't go wrong with any Boom! book you select, whether you go for the older Mark Waid stories (like Potter's Field, reviewed here), or the Planet of the Apes ongoings. I'm not sure exactly what they'll have at the Boom! table, but I can almost certainly guarantee it'll be good. Life exploding and can't make Baltimore Comic-Con? 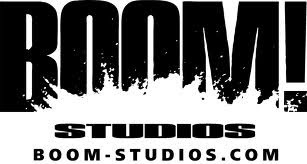 You can find Boom on the web here or grab their books on Comixology.